The city is one of the busiest I’ve ever visited and it really is a bustling metropolis. No matter where you go it’s a challenge to get through all the people. Many parts of the pavement especially on one of the main streets Nathan Road can be tight and its easy to start bumping into people. Thankfully this didn’t happen to me but almost did on a few occasions. Hong Kong is usually hot all year round just like Miami, Florida so this also doesn’t help when trying to get from A to B. I struggled to cope with the heat and had to keep walking into one of the malls to keep cool! I shouldn’t have had a heavy back pack on to be honest. Dining was good with just about every restaurant you could possibly think of. Was surprised at how good some of the local restaurants food tasted and most of them were constantly busy no matter where in Hong Kong they are. It seemed the small street stores selling food and small family run restaurants were best as that’s where the crowds were. Almost every street restaurant I walked past was full at dinner time! For those wanting to spend more money on dining there are plenty of grand hotels in Hong Kong. Hotels in the city are on the small side but that’s expected with Hong Kong’s limited land space. There is a 7eleven on almost every street corner so it’s very easy to get essentials for the hotel. Keep in mind the rooms are small and in fact one hotel i stayed in for two nights didn’t even provide me with enough leg room when on the toilet! but it was clean and nice. As this is a cruise site it wouldn’t be right to not mention the cruise ships. 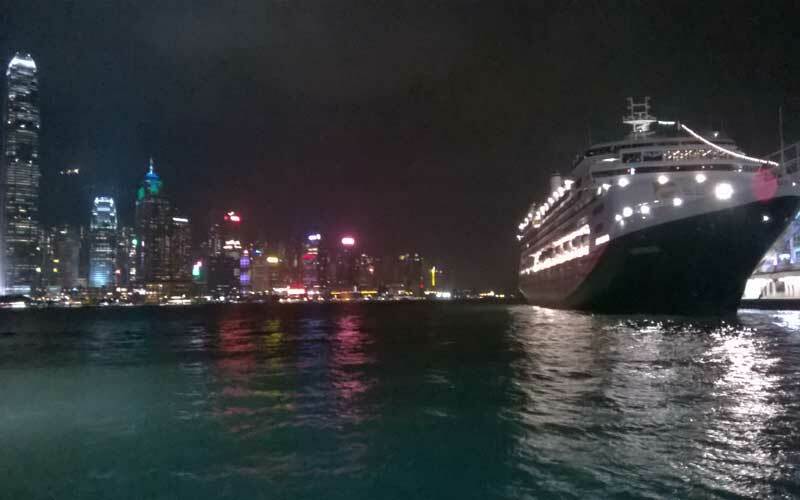 There is a Hong Kong harbor at Tim Sui Tsui which holds cruise ships including those from Holland America and Star Cruises. The dock is connected to the ocean terminal which is actually a busy mall that features plenty of well-known stores. The harbor is just a 1 minute walk away from the ferry that can take people to Hong Kong island. The Avenue of Stars is also about 5 minutes away so everything is so close and walking distance. Shopping isn’t too bad as Hong Kong offers everything you would expect from a large international city. The highlight for me was the mall called IFC which is on Hong Kong island near Admiral. There can be found lots of popular stores including the official Apple shop. IFC also has a MTR station directly underneath which boosts its importance. The mall is on the bottom half of a skyscraper and the city is not short of them! I made a visit to Disney Hong Hong because who doesn’t when it’s just a MTR ride away! In fact one of the only ways to get to the park is by MTR and the journey time takes about 20 minutes. The dedicated Disney MTR train had Disney decor which was really nice and just seeing all the kids faces as they got on the train was amazing. I won;t go into reviewing Disney but all i can say i felt like a kid again. Try to get there as early as possible as thats when there are no lines for any of the attractions. Try to stay until the evening so you can experience the day and night parades. All in all its a great city to visit but if your that person who is not fond on busy fast moving crowds then it;s not for you. Don’t expect to see any parks or get time away from all the street stress.